Nine out of ten (88%) company car drivers admit to speeding on motorways, according to new research from RAC Business, which represents a 7% increase on figures from last year. In fact almost half (48%) of company car drivers surveyed said they break the speed limit on motorways on most journeys, compared to only 26% of private motorists. The findings form part of the RAC’s Report on Motoring 2016*, in which just over half (51%) of company car drivers said they typically drive at 80mph on motorways and 7% drive at 90mph. This is also an increase on 2015 figures when 46% confessed to driving at 80mph and 5% to 90mph. What’s more, 60% of company car drivers think it is totally acceptable to travel at 80mph on motorways and a third (31%) think the current speed limit is inappropriate for the road. In line with that nearly three quarters (71%) believe the motorway speed limit should be increased to 80mph. However this compulsion to speed is not as widespread on more high risk routes such as country roads with numerous bends where only 5% travel over 60mph, or in 20mph urban area zones where two thirds of company car drivers keep within the limits. 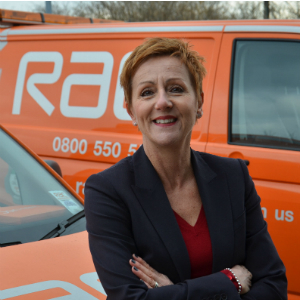 Jenny Powley,(Pictured) corporate business sales director at RAC Business, said that the Report on Motoring 2016 reveals some worrying upward trends and urged caution among business drivers who don’t see a problem with breaking the speed limit. She said: “Knowingly breaking the speed limit is a dangerous approach to driving, whether you think you can justify it or not, and the risks associated with speeding far outweigh the time saved. After all, driving at 80mph instead of 70mph will only save you six seconds a mile, or 10 minutes over 100 miles. “It’s also worth considering the impact of speeding on fuel efficiency. According to the Department for Transport, driving at 80mph can use 25% more fuel than driving at 70mph, so this can have a significant impact on the business’ bottom line. Is speeding problem within your fleet? tell us how you have managed to curb speeding offences in company vehicles, are all fines passed onto the individual responsible?